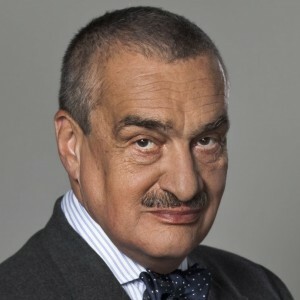 Karel Schwarzenberg is a Czech statesman and diplomat. He studied at the universities of Vienna, Munich and Graz. From 1984 to 1990 K.Schwarzenberg chaired the International Helsinki Committee for Human Rights. In 1990-1992 he served as Chancellor to the President of Czechoslovakia Vaclav Havel. He managed the company “R-Press”, where he published and funded the weekly publication Respekt. In 2004-2010 he was elected Senator of the Czech Parliament from the Green Party. From 2007 to 2009 he is a Minister of Foreign Affairs of the Czech Republic in the Cabinet of Mirek Topolanek. During the presidency of the Czech Republic in the European Union, he represented Europe internationally. Since 2009 he is a leader of the Czech center-right party (TPP 09) (Tradition Responsibility Prosperity 09). In 2010-2013 - Czech Foreign Minister in the Cabinet of Petr Nečas. From 2013 - Chairman of the Foreign Affairs Committee.